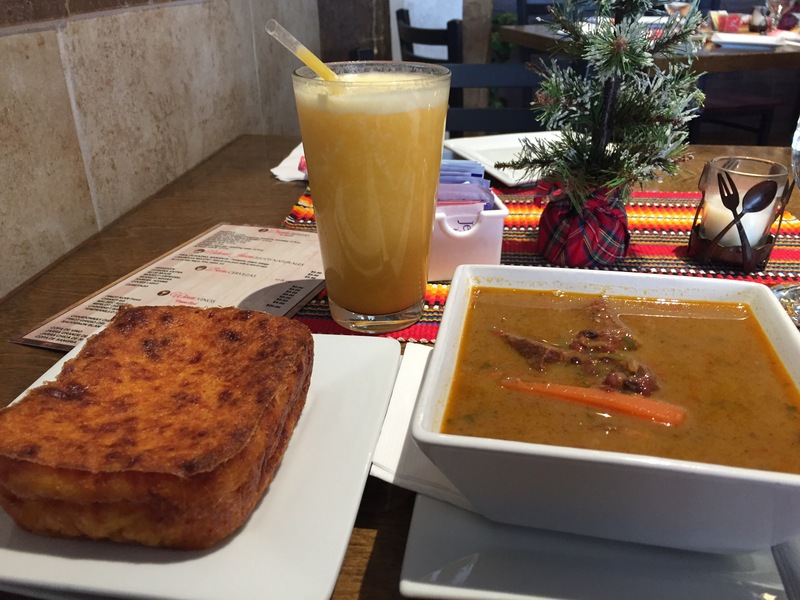 Plus, not many people have ever eaten Paraguayan food, unless they happen to be natives. Since my first visit to Greenpoint Ave., I’ve been extremely curious about I Love Paraguay, which Yelp and Grubhub had raved over. It’s another venture into South American cuisine. The restaurant itself had the air of a small Paraguayan village; the CNN channel was in Garbado, or Columbian Spanish. The people working there was gregarious and kind. The regulars brought many friends with them, to try out the food for themselves. And most of the food was cheaply prized, aside from the entrees. I ordered three small items: 1. the Soup-of-the-Day: The Beef and Bean soup = Kumanda S’o, 2. Sopa Paraguayan, a native bread, and 3. Fresh peach juice = Jugo de Durazno. The Kumanda S’o ($7.00) was a big bowl of thick and hearty stew, with thick cuts of slow-cooked beef and carrots, with a myriad of spices swimming along with the red lentil beans. Sopa Paraguaryan was, wow…imagine a corn-based cake-like bread that was married with cheesy scrambled eggs, and this was their gorgeous, golden child. It was so rich and creamy; I cursed myself for only having only one Lactaid, so I couldn’t finish it. It was amazing ($3.50). The peach juice, one of the waitress’s favorites, was sweet and refreshing ($5.50). Total price: $18.00. As I stared at the regular college-boys tearing into their empanadas, and the family enjoying a plate of many seared meats, I considered myself lucky to be there in that moment.